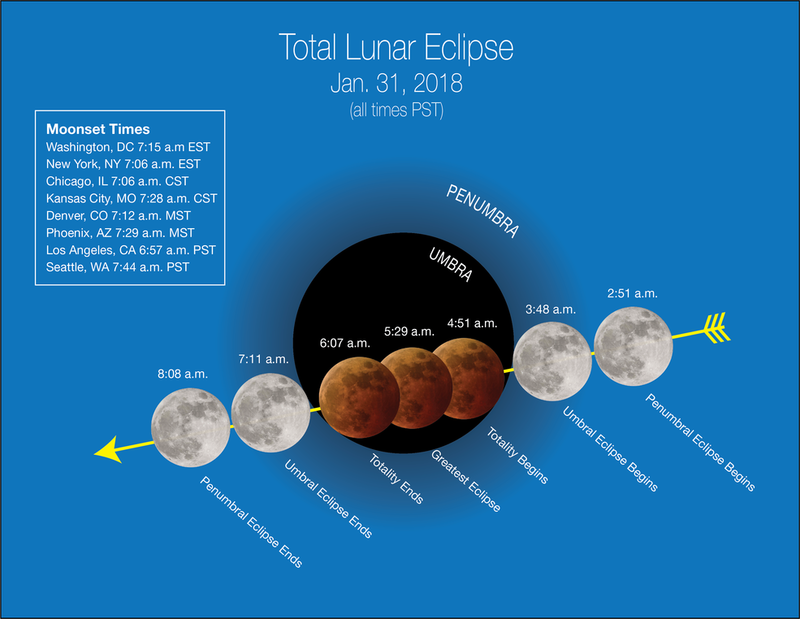 A Super Blue Blood Moon lunar eclipse will occur during the predawn hours on Wednesday, January 31, 2018. This once-in-a-lifetime astronomical event hasn't happened in 150 years because it is very rare for a Blood Moon lunar eclipse to occur on the same night as a Blue Moon. What time is the Super Blue Blood Moon Lunar Eclipse? The Blue Moon will start to enter the outer part of Earth’s shadow at 5:51 a.m. Eastern Time / 4:51 a.m Central Time, but the start of the lunar eclipse won't be very noticeable to people in the eastern half of the United States. 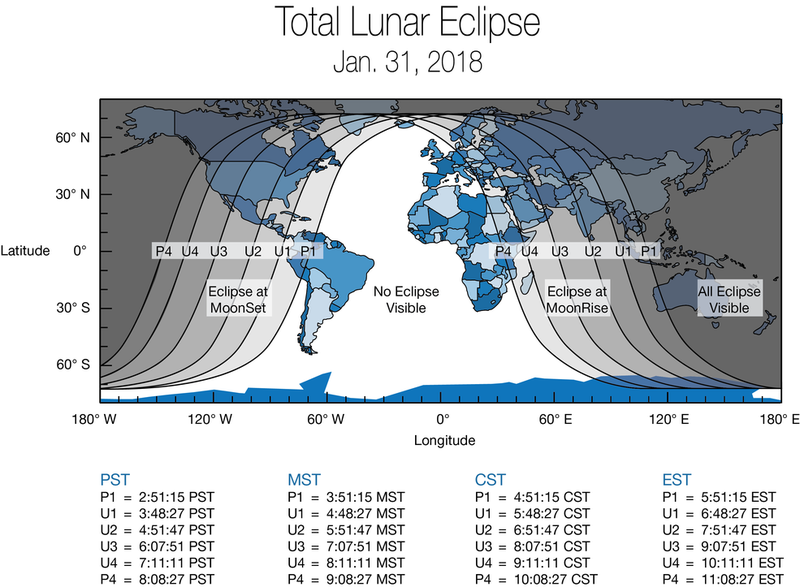 Viewers in California, Oregon, Washington and western Canada will see a change at the very beginning of the lunar eclipse at 3:48 a.m. Pacific Time. The lunar eclipse will occur just before the moon sets in the west. So a clear view of the western horizon is key to watching this lunar eclipse. Why Is It Called A Super Blue Blood Moon Lunar Eclipse? Total lunar eclipses are referred to as "Blood Moons" because they often appear dark red in color. For a total lunar eclipse to happen, the Moon must be full, which means it is directly opposite the Sun, with Earth in between. The reddish appearance of the Moon is caused by the Earth's atmosphere filtering out blue light from the sunlight that reaches the Moon. A Super Moon occurs because the Moon is in an elliptical orbit around the Earth. When the Moon is closest, it is at its orbital perigee, which is why a Super Moon is also known as a Perigee Moon. 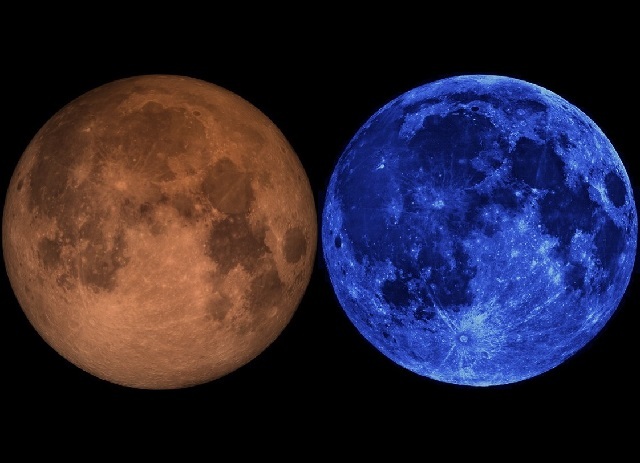 Blue Moons occur when there is a second full moon in a calendar month or when a season has four full moons. Full moons are separated by 29 days but seasons are 88 to 92 days long - so it is possible to fit four full moons into a single season. This happens just over two-and-a-half years, on average. When there are four full moons in a season, the third full moon is considered a Blue Moon. This is why the phrase "Once in a Blue Moon" is commonly known to mean something rare and offbeat because of the rare occurrence of a Blue Moon. Will the 2018 Super Blue Blood Moon look blue? The date of a full moon doesn't affect the full moon's color. The Full Moon on Wednesday, January 31, 2018, will appear pearly-gray to most locations on Earth before and after the lunar eclipse. According to NASA, the key to a moon appearing blue is to have lots of particles slightly wider than the wavelength of red light (0.7 micron) and no other sizes present in the air. This is rare, but volcanoes sometimes produce such clouds, as do forest fires. Humans saw blue moons almost every night when the Krakatoa volcano exploded in 1883 with the force of a 100-megaton nuclear bomb. Plumes of ash rose to the very top of Earth's atmosphere. Some of those ash-clouds were filled with particles about 1 micron wide - just the right size to strongly scatter red light while allowing other colors to pass.